Oral mucositis is described as painful mouth ulcers and inflammation in the mouth2. In fact, oral mucositis is one of the most common side effects experienced by cancer patients when undergoing chemotherapy, but it is frequently under-reported and can lead to high morbidity and complication rates3. 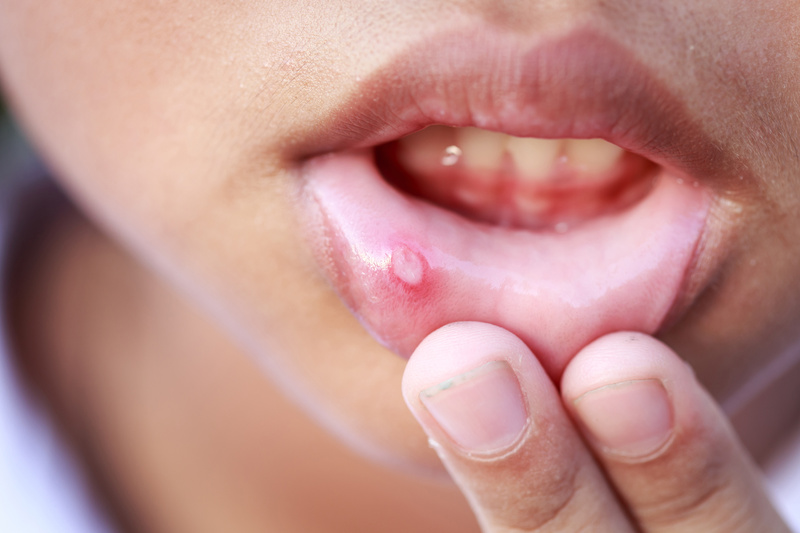 These sores can have a significant impact on person’s quality of life1. They can cause severe discomfort and can impair a person’s ability to eat, swallow or even talk1. Oral mucositis generally develops five to 10 days after the initial treatment, and can last anywhere from one week to six weeks or more1,4. Mucositis occurs when cancer treatments break down the rapidly divided epithelial cells lining the gastro-intestinal tract, leaving the mucosal tissue open to the development of ulcers and infection4. More specifically, chemotherapy can cause mucositis to develop due to the low white blood cell count; and radiation can cause mucositis to develop due to the inflammatory effect of the radiation energy on the oral membranes (mucosa)4. The most serious cases of mucositis can lead to a number of associated health complications. Of particular concern is that mouth ulcers can become infected with bacteria. The infection can spread to the blood and then on to other organs, and can lead to the development of sepsis which can be life-threatening2. Poor oral or dental health. Smoking or chewing tobacco and drinking alcohol. Diseases such as kidney disease, diabetes or HIV/AIDS. While you may not be able to stop mucositis from occurring, there are steps you can take before beginning radiation or chemotherapy treatment to help alleviate its side effects and symptoms4. In many cases your doctor may recommend you visit a dentist who specialises in oncology patients. A good oral care regimen can help prevent or decrease the severity of mucositis, and can also reduce the change of infection from open mouth sores4. There are a number of strategies adopted by oncologists to minimize the adverse effects of cancer therapy such as dose reduction, and other preventive treatment options1. A review of clinical studies showed that there are ice chips, antibiotics and Benzydamine containing oral solutions are a few options to help relieve the symptoms1. 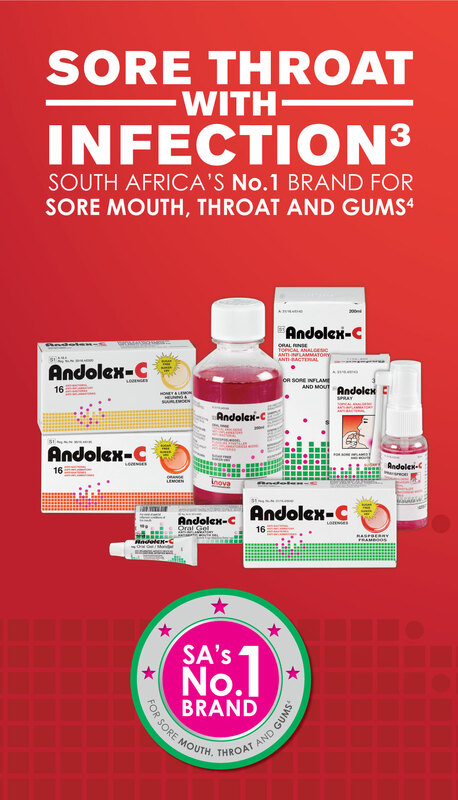 The Andolex range and products, available from leading pharmacies, are known to provide relief for patients suffering from a sore throat, mouth or gums5. The Andolex-C range includes Andolex C Spray, Andolex C Oral Rinse as well as Andolex C Oral Gel. The Andolex C Oral Gel contains Benzydamine HCL and Cetylpyridinium which provides a 4 in 1 effect for fast, effective relief 5,6,7,8. This range of products can reduce pain, inflammation and swelling of the mouth or throat, offering effective local anaesthetic action5,8. Furthermore, Andolex C Oral Gel helps to provide relief from mouth ulcers or sores, sore gums or from irritation due to oral mucositis10, with its effective local anaesthetic action5,8. The gel also provides analgesic relief and is easy to apply9,10. Oral mucositis can be a very serious complication of cancer chemotherapy. Pain, malnutrition due to not being able to eat properly, dehydration, and risk of infections all contribute to the dangers associated with this condition. These serious complications can lead to treatment delays or treatment termination, hospitalisation, and increased medical costs3, let alone the effect it has on the patient’s quality of life1. Speak to your doctor, pharmacist or specialist about ways to alleviate the discomfort of oral mucositis. This editorial has been commissioned and brought to you by iNova Pharmaceuticals. Content in this editorial is for general information only and is not intended to provide medical or other professional advice. For more information on your medical condition and treatment options, speak to your healthcare professional. Mucositis – Your MD (https://www.your.md/condition/mucositis/#chapter-introduction) Website accessed on 14 May 2018. The Oral Cancer Foundation. Mucositis (https://oralcancerfoundation.org/complications/mucositis/ ). Website accessed on 14 May 2018. Andolex-C Spray Impact RX January 2018 (Constructed Market). Almazan NA. Benzydamine HCl 0.15 % for oropharyngeal diseases and surgeries: A review of clinical trials. Philip Scientific J 2009;42(1):37-42. Cingi C, Songu M, Ural A, et al. Effect of chlorhexidine gluconate and benzydamine hydrochloride mouth spray on clinical signs and quality of life of patients with streptococcal tonsillopharyngitis: multicentre, prospective, randomised, double-blinded, placebo-controlled study. J Laryngol Otol 2011;125:620–625.